Jewel Spears Brooker Professor emerita at Eckerd College; co-editor of the forthcoming "T. S. Eliot's Complete Prose" (vols. 1, 7); author of "T. S. Eliot and Our Turning World (2000)"; and most recently, "T. S. Eliot: The Contemporary Reviews" (2004). Anthony Cuda Professor of English at University of North Carolina, Greensboro; co-editor of the forthcoming "The Complete Prose of T. S. Eliot," Vol. 2 (1919-1926); and author of "The Passions of Modernism: Eliot, Yeats, Woolf and Mann" (2010). Excerpted from “Four Quartets” by T.S. Eliot. All rights reserved. MS. DIANE REHMThanks for joining us. I'm Diane Rehm. When poet, playwright and essayist, T.S. Eliot, died in 1965, "Life" magazine mourned the passing of the "Age of Eliot." Best known for the "Wasteland," Eliot changed course in the late 1930s and wrote a set of poems he called "Four Quartets." MS. DIANE REHMA deeply spiritual mediation on time and the path to redemption, Eliot considered it his greatest work. Joining me for this month's "Readers' Review" of T.S. Eliot's "Four Quartets," David Gewanter of Georgetown University. Jewel Spears Brooker of Eckerd College and Anthony Cuda of the University of North Carolina at Greensboro. MS. DIANE REHMDo join us, 800-433-8850, send us an email to drshow@wamu.org, follow us on Facebook or send a tweet. Good morning to you. MS. JEWEL SPEARS BROOKERGood morning. REHMIt's good to have you all with me. I'm really looking forward to this discussion and I should alert our listeners, you're going to be hearing T.S. Eliot read some of the "Four Quartets." Jewel Brooker, if I could start with you. Just tell us a little about T.S. Eliot. I know he was born in 1888 right there at the turn of the century. What was happening in the world, what was going on in his own life? BROOKERT.S. Eliot was born in St. Louis of a very distinguished family from the Boston area. His grandfather was one of the founders of Washington University, a missionary, a Unitarian missionary actually to St. Louis. The context of his upbringing is really the entire legacy of the 19th century. The subjectivity of romanticism, the Darwinian burst that brought about the social sciences. BROOKERHe returned to the East as a student at Harvard at a time when one of the main projects of the university and of intellectuals at large was trying to integrate the Darwinian and scientific insights into the humanities. And he studied at Harvard, he went abroad and studied in Paris, he studied at Oxford and then he intended to come back to the United States and perhaps be a professor at Harvard but was prevented by the war and he married an Englishwoman and became a man of letters in England. REHMJewel Spears Brooker, she's professor emerita of literature at Eckerd College. She's author of a number of books, "T.S. Eliot: The Contemporary Reviews" and "T.S. Eliot and Our Turning World." She's co-editor of Volume 1 of the forthcoming "The Complete Prose of T.S. Eliot." David Gewanter, how did T.S. Eliot come to write the poems contained in "Four Quartets?" GEWANTERWell, he was writing in "Murder in the Cathedral" and he had several lines that he and his director sort of agreed weren't really fitting and they became the basis of "Burnt Norton" and he started to compose from that in the 1930s as the sort of drumbeats of war were coming in. GEWANTERAnd the poem "Burnt Norton" has five parts and he, I think, it was going to be called the Kensington Quartet because he was living in Kensington at the time and so it's, he started this long somewhat abstract mediation on time and the self. As war was coming in and as many troubles were starting to reach London and the sense of peril was coming upon everyone. REHMAnd, Tony Cuda, how did Beethoven work his way into the quartet? CUDAWell, I think Eliot was always an admirer of Beethoven and the late string quartets but he was also an admirer of Bela Bartok and his quartets and he said actually while he was working through the second of the quartets, I want to stop to mention that this was, quartets were, David suggested, the quartets were almost a kind of accident. CUDAThey began with these lines that were discarded from "Murder in the Cathedral" but that Eliot liked too much to get rid of. So he stuck them at the beginning of this new poem and he composed "Burnt Norton," which we're going to hear and talk about and put it at the end of his collected poems in 1936. So this was a standalone poem that was meant to be the end of a thing. CUDAAnd when he started to think about the later poems the idea became that he was going to pattern them on similar models as the earlier ones and that's when the idea of a quartet came to mind. And in fact he wrote to a friend of his, to John Hayward, around the time. He said, "I should like to indicate, by using this musical analogy I should like to indicate that the poems are all composed in a particular set form." CUDASo the idea of a quartet was really more a matter of allowing the words to reach a kind of musical resonance, I think, rather than, scholars of course will argue, but rather than a kind of homage to Beethoven. REHMSo tell us about the first quartet "Burnt Norton." What is that meant to stand for? CUDAWell, the title of each of the quartets is a place and that's an important imaginative catalyst for each of the poems, a place with personal and historical resonance for Eliot. But the resonance kind of falls away and "Burnt Norton," "Burnt Norton" is an English manor house two hours west of London in Gloucestershire. CUDASo it's in a beautiful English countryside, you can go and visit it today and as a matter of fact if you join up for the international Eliot summer school you can go every year at the beginning of July. They visit, in addition to 10 days of lectures, they visit three of four quartet sites in England. CUDAIt's a fantastic and wonderful opportunity. I think Jewel may actually be there lecturing this summer. Again, accidentally almost Eliot was staying with a woman with whom he had long been attached, had a long time relationship, Emily Hale, a long lost love of sorts in 1934. REHMAnd this is after he has been married? CUDAThat's right, this is after he has been married for 20 years. His marriage has gone downhill and he has left his wife and he is re-establishing a relationship with Emily Hale. She's visiting him in England at the time, the two are staying with her family in the English countryside. CUDAAnd they take a walking tour and they come upon this abandoned manor house called Burnt Norton and really what's more important than the manor house are the gardens. They walk through these beautiful formal rose gardens into this area where there is a drained concrete pool. And that's where this imaginative vision, this kind of waking dream comes, of the life they could have led. MR. T.S. ELIOT"Time present and time past are both perhaps present in time future. And time future contained in time past. If all time is eternally present all time is unredeemable. What might have been is an abstraction remaining a perpetual possibility only in a world of speculation. What might have been and what has been point to one end which is always present. MR. T.S. ELIOTFootfalls echo in the memory, down the passage which we did not take towards the door we never opened into the rose garden. My words echo thus in your mind but to what purpose? Disturbing the dust on a bowl of rose leaves I do not know." REHMAnd of course that is T.S. Eliot himself reading from the first quartet, "Burnt Norton" and, Jewel, it would seem that time is so much in the forefront there as he reads that poem. BROOKERWell, absolutely, time is the overarching topic of all the quartets. To pick up on something mentioned by both David and Tony, this throwaway from "Murder in the Cathedral" came at a point in the play when Thomas was tempted to return to King Henry II and resume his place as archbishop to go back to a point in the past and to create a different present really. BROOKERAnd this is exactly the situation that Eliot was in with Emily Hale. And so it starts with this mediation which triggers this. He met Emily Hale in 1913, she was interested in the theater and in fact became a professor of theater at Smith and at Scripts College in California. BROOKERAnd he was with her, they were just tourists in this, on this occasion but there are several references in the opening scene to that visit and there might have been children and all the might have been's of course are abstractions. They were there in September of 1934, early September, the very beginning of September and there are references in the opening scene to the autumn heat. BROOKERThe roses were in their second bloom but the autumn heat becomes a sort of metaphor for late blooming love as well as late blooming roses. REHMJewel Spears Brooker, Anthony Cuda, David Gewanter, we're all here to talk about T.S. Eliot's "Four Quartets." Stay with us. REHMAnd welcome back. 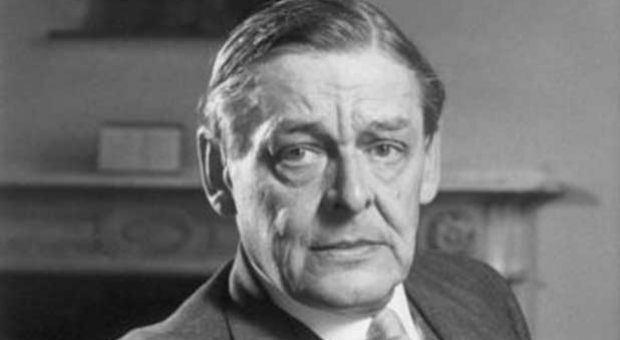 In this hour, our April Readers' Review, which is of course poetry month, we selected T. S. Eliot's "Four Quartets." And we have some readings from each of the Quartets. Interestingly Burnt Norton, which you've just heard, "East Coker," "The Dry Salvages." Is that the correct pronunciation? REHMAnd "Little Gidding. " I wonder to what extent high school, college students are reading and enjoying T. S. Eliot today, David? GEWANTERWell, Ted Hughes, when T. S. Eliot died, said I felt like I'd just gotten a crack on the head followed by an instant headache. And at the same time he said he was a slightly disapproving father. And he had to figure out how to move on. And it's a little possibility that students today may see Eliot as the disapproving father at the table and telling them that their youthful interests and indiscretions are going to be leading to eternal damnation, which not every undergraduate is eager to hear. REHMWhat do you think, Tony? CUDAI teach this poem a lot -- this poem and Eliot's other poems as well. And his first poem J. Alfred -- "The Love Song of J. Alfred Prufrock" is incredibly compelling in the classroom. But I think a sure way to provoked kind of dumbfounded stares of intimidation and silence is to present a poem like "Four Quartets" as a philosophical meditation on time and time. And I think probably more -- what -- that's how it was presented to me originally in college. REHMAnd of course that's how he sounds as he reads it. CUDAIt certainly is how he sounds, right. But it is really a much more powerful poem when you consider it as the portrayal of a speaker's struggle with what to hold onto and what to let go of. Because time for Eliot is really about change. It's about -- and changes about, again, what slips through our fingers. And I think the entire poem -- each of the quartets is deeply concerned with the idea -- the question, do I hold on, do I value the things that are around me. And does that bring me happiness? CUDAOr is more happiness -- does more happiness lie down the road of dispossession, if I let things go? If I am free of the kind of values and possessions. So I think that's at stake in every one of the quartets. And that's a powerful way for students to think about it. BROOKERWell, I teach "The Quartets" a lot too. And I don't find that students resist the poem. One reason is that Eliot juxtaposes the individual, the personal, the very intimate with these -- he juxtaposes them with these big philosophical issues. And the two -- one way of reducing the themes of the poem in such a short time we have to reduce them, but he deals with two aspects of our lives that students can understand quite easily. The first has to do with our duality, with the fact that we're mind and matter, soul and body, that we're full of contradictions. And that this is part of the human condition. BROOKERThis goes all the way back to "The Love Song of J. Alfred Prufrock" and Eliot's early debates between body and soul. And connected with that and also part of being human is the fact that we long to solve these things and we're always trying to. And we never quite can do it. So trying to resolve these puzzles without seizing to be human is something that students deal with all the time. BROOKERThe other thing that students deal with, that first part that I was talking about I think has to do with what we are as human beings. The other big thing that all students can understand, is the reason they're in the university, is how we know. And this poem deals how we know in time. We know by toothaches, by heartaches. We know by what's all around us. But we -- intuit we know that there's a bigger picture and how to connect this intimate personal experience with the big things that matter. This is one of the big things in Quartets. BROOKERAnd Eliot shows this over and over by juxtaposing his own experience in the rose garden with the medication on the big picture. GEWANTERWell, this is very well spoken what everyone is saying about valuing the things around us and also understanding about dispossession and what we're trying to hang onto. So we were talking about students and what they think of it. It's a strong commitment to go into these poems and to go into the kind of philosophical discipline and education that it takes to follow what Eliot -- where Eliot goes, his references, the echoes that we find from many other poets and voices that come in. GEWANTERAnd I really appreciate what Jewel was saying about putting students on the spot and having them look at their own kinds of choices. And it's not only toothaches and heartaches but many other aches out there happen. REHMLet's talk about "East Coker," Tony. CUDASure. Well, "East Coker" is the second of the four quartets. And it, as we said, is really the first of the four quartets. And so far as it was the first time that Eliot realized he was writing "Four Quartets." These poems weren't published as the first part one of the "Four Quartets" and part two. They were published in pieces. And when "East Coker" was published Eliot realized, well, this is going to be a sequence, right. CUDAAnd it is based on -- "East Coker" is a village in Somerset. It's about three hours outside of London and it is the home of Eliot's distant ancestors. So it is a kind of connection, a kind of ancestry inherited linking him to England, a place where he was for a long time an expatriate and not an English citizen until 1927. And there he has another waking dream or vision of this kind of pastoral rural countryside. People dancing in a marriage ceremony. REHM...because they all turn to ash. CUDABecause everything falls away, right. And the poem's going to be a process of asking, what happens if I let go on purpose? ELIOT"Oh, dark, dark, dark they all go into the dark, the vacant interstellar spaces, the vacant into the vacant. The captains merchant bankers, eminent men of letters, the generous patrons of art, the statesman and the rulers, distinguished civil servants, chairmen of many committees, industrial lords and petty contractors, all go into the dark. ELIOTAnd dark, the Sun and Moon and the Almanach de Gotha and the Stock Exchange Gazette, the Directory of Directors, and the cold, the sense and lost the motive of action. And we all go with them into the silent funeral, Nobody's funeral, fir there is no one to bury. I said to my soul, be still, and let the dark come upon you, which shall be the darkness of God." REHMIt's almost a sense of his own death. Dark, dark. Am I overemphasizing it, Tony? CUDAI don't think so. Except that it's a sense that everything passes, right. It's a sense of death as things passing. The history has passed, yesterday has passed. But, you know, I think it's important to -- again, this is one of Eliot's great characteristic traits to weave in seamless illusions. The first words of this stands out, dark, dark, dark. Actually an illusion lifted right from Milton's 17th century poem "Samson Agonistes" when the Biblical hero Samson was blinded and shorn of his strength as hair by his enemies. CUDAAnd Eliot, in this passage, turns this incredibly painful moment into an exemplary moment in order to show us how things pass. And then he turns and says, I said to my soul, be still and let the dark come upon you. In other words, he's not running from the disappearance, the dispossession, the sense of surrender. He wants to turn and embrace it and say, I've tried the path of vision of dreaming and possibility. Now let's try the path of surrender. BROOKEREach middle part -- the middle part of each quartet has two parallel journeys. One journey is a journey in time and that is going into the dark. And he includes imminent men of letters, which he is at this time in that. The other one is a descent into the self, a descent into the darkness. That descent, which in a way -- takes you out of time can only happen in time. And so we have this meditation here on -- really on how to redeem the time, how to use the time in such a way that everything is not lost as you go into the dark. BROOKERAs you go into the dark what you do minute by minute and what you can experience at these intersections when time seizes to exist are ways of holding onto something. And this descent always has to do in the quartets with disciplined meditation, with memory. These are characteristics emphasized by one of his main sources and inspiration, St. John the Cross who felt that they -- who in the 16th century who said that the ascent to God and the ascent to self knowledge really involves disciplined meditation and a descent into the self. REHMDavid, how religious a man was T. S. Eliot? GEWANTERWell, he was born and bred in the midst of Unitarianism as he said, but it was recorded that he saw Michelangelo's Pieta in Rome and fell on his knees. And many people take that as a kind of moment of visible conversion. I think he lived in -- lived with the prospect of death and the fear of death and what would come after death. Like Sam Johnson, he was a man of the city but sort of haunted by the prospect of death and damnation. You can see in this passage listing all these people, it's a kind of Dante-an journey going through all the people of your life and seeing them later on. Seeing their second selves, their dead selves come back to you. REHMBut then he's also talking about -- almost talking about Wall Street and the stock market and sort of bringing in these real life structures to the idea of these ethereal figures. GEWANTERWell, the one thing I wanted to mention is that Eliot was living in London at the time, and lived in London for most of his life. He was living at this time -- he was by this time a well-known poet, the poet of the wasteland. He was also working at Favor and Favor, the publishing house. So he was also a kind of guide to up and coming poets and authors. But, you know, he had separated from his wife but wasn't living in kind of a posh bachelor's pad in London, right. He was living in a small secluded room in the clergy house of St. Steven's Anglican Church. REHMBy himself, not with Emily. GEWANTERBy -- that's exactly right. That's exactly right. Not with Emily, no. Emily was a kind of a far off possibility. He was living in this room because he was a church warden. So he's living here next to the clergy of the church. He was living in isolation and in dispossession. REHMAnd dealing with all of his own desires and disappointments. GEWANTER...desires and guilt for having left Vivian. And also a -- you know, a vow of chastity that he had taken when he converted to Anglo-Catholicism in 1927. REHMAnd you're listening to "The Diane Rehm Show." So he's there living by himself in this sort of self-inflicted isolation. He must be very unhappy and yet he's pouring out this poetry. CUDAWell, I think Eliot's religion -- Eliot's religious sensibility was actually most comfortable in a state of danger. That is, I think his -- he grew up in the Unitarian Church where basically, as he described it, you simply did your -- said your prayers, did your good deeds and that made things okay. You'd go to heaven. And Eliot's sense of religious devotion and responsibility meant you had to live your life as if every day was to be your last almost in severe and profound devotion and meditation and self questioning. CUDAAnd so to be at this edge in this kind of -- with a sense of intensity and demand and danger, I think for him was part of what the religious journey called for. REHMJewel, are the poems meant to be sequential? BROOKERYes. Well, as Tony said, the first poem was written as a standalone poem. The others were conceived during the war or -- and just before the war. The first one was published in 1935, the others in 1940, '41 and '42. And then the entire sequence as a whole. But they're definitely meant to be a whole. And a quartet is -- I mean, when Eliot is -- he uses the musical analogy in part to bring them together. A quartet is a piece scored for four instruments, not necessarily a piece of four movements. It's a four-in-one. BROOKERAnd the four instruments, so to speak, are the four elements he uses, air, earth, water and fire, the four seasons and the four places and the parallel form in each quartet. But mainly I think for general reading it's the theme in variations. BROOKERBecause all of the quartets work on the same themes with variations. REHMDavid, how does "Four Quartets" fit in in terms of the lexicon of English modernist poetry? GEWANTERWell, there's an arc that you might take from Eliot's "The Wasteland," the famous fragmented poem of five parts that is (unintelligible) reaction to the great war, World War I and the reaction to a broken marriage. And so in some ways the soul and stress is both personal and domestic and looking more at widely cultural. Eliot -- as World War II is coming on and as London is being bombed, thousands of people killed at night and he is there coming into London and serving as a fire warden, which is a little different than a church warden. It's to keep the fires off your buildings and so forth. GEWANTERAnd so in midst of that kind of terror he is seeking this kind of meditation philosophy and discipline. It's quite strong and it fortifies him at a time when everything looks chaotic. REHMDavid Gewanter. He's professor of English at Georgetown University. When we come back we'll open the phones, take your calls. I look forward to speaking with you. REHMAnd one of our listeners has reminded us that a production Eliot's final play "The Elder Statesman" opens in Washington, D.C. this week. How timely. Let's go to Cazenovia, N.Y. Good morning, Aaron. You're on the air. AARONGood morning, Diane. And I'm very fascinated with the subject. And, you know, poetry and people like T.S. Eliot, you know, and (unintelligible) and such, you know, bring interesting associations. In my mind, I'm thinking about two of my favorite authors, Woody Allen and Allen Ginsberg. And probably the introvert of Eliot and the extravert of Ginsberg and how, you know, it's probably an obvious comparison and contrast. AARONRight. And so the psychiatrist says, and why is that important? And his mother says (word?). And Woody Allen says, well, you know, why do anything? What's the point? And I can't help but -- when I think of that, when I think of the self absorption of the T.S. Eliot. REHMWhat do you think, Tony Cuda? CUDAWell, I appreciate the call. I think probably self absorption is the wrong word because Eliot's religious devotion was such that, you know, it was incredibly demanding both spiritually and emotionally, but that he was also an incredibly active individual, both in terms of the time that he spent helping other poets, and the talks, lectures and contributions that he made to dozens of charitable societies around London. So he was really a man of the world as well. GEWANTERWell, I love that movie reference that Aaron made. And I think the psychiatrist was smoking as he was telling him how long the university was going to last, so there was a little edge to that. But one city that Eliot didn't really cover too well was Patterson, N.J. It's not quite a city, it's a big town. But out of that comes William Carlos Williams and Allen Ginsberg. And neither of them were much persuaded by Eliot and didn't feel that Eliot's vision of the world was reflecting their own experience and how poetry could engage and render it. REHMInteresting. Here's an email from Evron who sends what he says is a comment about his favorite quartet. He says, "Where is the knowledge we have lost in information? Where is the wisdom we have lost in knowledge?" He says, "This quartet is more and more relevant to today's digital age." I think that's rather interesting that he makes that connection. Let's go now to Tallahassee, Fla. Good morning, Randy. You're on the air. RANDYGood morning, Diane. I think Eliot was having not only an emotional relationship with God, but a literary love affair with the bible as well. The poem "East Coker," the second quartet, is so biblical in its language and there are so many biblical echoes. Like it begins with "In my beginning," whereas of course the Genesis begins "In the beginning." And then you hear echoes of Ecclesiastes. As you go further down in that first paragraph, he says, "A time for building, a time for living, a time for generations, a time for the wind to break the loosened pain." I hear in that Ecclesiastes, "A time to sow, a time to reap." RANDY...come back to me in a second, okay? GEWANTERWell, certainly the caller's -- Randy's quite right about all of the echoes of the Bible and how that's being used and put forward. Jewel mentioned meditations and spiritual disciplines. And I think that's often what Eliot is looking at. And sometimes they come out of sermons; Lancelot, Andrews and other people who are involved in the oratory of the bible. REHMAnd you can easily get to the word prayer, can you not, Jewel? BROOKERAbsolutely you can. And the question is a good one though, and the observation is a good one. "Burton Norton," the opening line of "Burton Orton," "Time present and time past" are both perhaps present, and "Time future" is also an echo from Ecclesiastes. In Chapter 3 there's a verse that says "That which hath been is now and that which is to be hath already been." And there are other references about time. There will be time for dancing, a time for darkness, a time for light, and other biblical references. BROOKERBut, yes, prayer is very important in the quartets, particularly in the last three, the fourth part is a sort of prayer. And the fourth part of "Little Gidding" is actually a sort of theodicy or an attempt to deal prayerfully with the problem of war and evil. CUDARecognizing always I think that for Eliot, as well, always recognizing that the words -- the words aren't going to do it, that words alone are simply an occupation of the mind and that they're going to fall away. And at one point he says, "The poetry doesn't matter." So this is a poet using words to approach something divine and to approach an intense struggle, but realizing that words, prayer, meditation, all of that falls away when you reach the darkness of God. REHMOh, dear. And, Randy, I'm sorry, I've lost you by mistake. If you want to call us back, I'll try to get to your second question. REHMI want to hear about "The Dry Salvages," because, first of all, it's named for a group of rocks in the north Atlantic near the Massachusetts coast. I gather it's where Eliot spent his boyhood. CUDAIt was. Yes, Diane. He was born in St. Louis as Jewel reminded us, but spent almost every year, almost every summer with his family in Gloucester, Mass. And he learned to sail off the coast there. The Dry Salvages is a rock formation as you said near the port of Gloucester. And he'd learned very quickly by learning to sail and from listening to the fishermen that these rocks were incredibly dangerous and, in fact, that's what he says that in a storm or in difficult weather when it's dark you can't see them. They're really only about 10 or 15 feet above sea level. CUDABut there is an immense formation below sea level. So they represent I think in this poem a kind of perpetual risk and danger, right, of running oneself upon the rocks. And for Eliot that was again part of the spiritual life, the pain and danger. ELIOT"The river is within us. The sea is all about us. The sea is the land's edge also, the granite into which it reaches, the beaches where it tosses its hints of earlier and other creation: The starfish, the horseshoe crab, the whale's backbone, the pools where it offers to our curiosity the more delicate algae and the sea anemone. It tosses up our losses, the torn seine, the shattered lobsterpot, the broken oar and the gear of foreign dead men. The sea has many voices, many gods and many voices." REHMCan you see those Dry Salvages? BROOKERYou can see them. I've actually, and I'm sure Tony has too, taken boat trips out to see them in good weather. Eliot's use of the rocks and the water here are very significant. This is in a way a memory poem, but a reflection poem. But he uses the river, the Mississippi, as a symbol of this movement in time that he's concerned with, and the sea as a symbol of the timeless. BROOKERAnd in this -- in the first part of "Dry Salvages" more than in other parts, he actually talks about the different kinds of time. About the subjective time of the anxious women and wives lying awake at night wondering when the night will end, of the time that's older than chronometers, of the time between midnight and dawn, of Chronos, Chiros, the right time, subjective time, eternity. GEWANTERActually I almost have a question for Jewel because I'm delighted in what I'm hearing. What happens with the bell then? I mean, the time is going on and we're having these -- the sense of time in the sea is very different than land time. And then the bell rings. Is that the end? Is that put across time? BROOKERNo. I think the tolling bell is the bell, you know, that is constantly ringing. The tolling bell measures time, not our time, rung by the unheard groundswell, a time older than the time of chronometers, then time counted by anxious worried women lying awake calculating the future, trying to unweave, unwind, unravel and piece together the time in the future between midnight and dawn. I mean, he's dealing with historical time, with time out of history, but still in time, with Chiros, the right moment in time, with eternity, with all these sorts of times that are bound into the human condition. CUDAWell, I was just thinking about some of my favorite lines in this poem. We've talked a lot about the philosopher Eliot, the religious poet Eliot, the lyric poet Eliot and these poems. Really shines through in very simple and straight forward lines that I think poets -- any poet today would strive to emulate. Right after we left off with that passage "The sea has many voices, many Gods and many voices" are these beautiful lines, "The salt is on the briar rose, the fog is in the fir trees." It has beautiful lyrical moment, perfectly stated it could be prose, but it's not, it is a perfect lyrical moment that I think we forget to the detriment of the poem. REHMAnthony Cuda, he's professor of English at the University of North Carolina, Greensboro. He's the author of "The Passions of Modernism; Eliot, Yeats, Woolf and Mann," and co-editor of Volume 2 of the forthcoming "The Complete Prose of T.S. Eliot." And you're listening to "The Diane Rehm Show." Let's go quickly to Dallas, Texas. Good morning, John, you're on air. JOHNGood morning, Diane. Thank you so much for taking my call. JOHNAnd for this wonderful topic. I was hoping to bring up Eliot's ex-patriot days in Paris when he paled around with Hemingway, Joyce, F. Scott Fitzgerald, Ford Madox Ford. The key figure for the success of all of those authors was Ezra Pound who was arguably the greatest poet of that time, and possibly in American literature, who he, himself, was a fascinating character. He was actually arrested and kept in an insane asylum for about 12 years. And all the aforementioned authors tried to come to his aid. Wasn't Ezra Pound -- doesn't Eliot resonate from Ezra Pound? And Ezra, of course, is the reason all of those aforementioned authors were so successful. CUDAYes. Eliot was a great friend of Pound. It was Pound who was instrumental in publishing Eliot's first poetry and his first book. He remained a long time friend. Pound was extremely demanding friend however. He played a great role in the revision of "The Waste Land." But he was extremely demanding, so much so that when Eliot was a publisher at Faber and Faber, he once told someone that he spent probably more time answering letters from Ezra Pound than he did working on forthcoming books. But he was an incredibly important presence in modernism and for Eliot. REHMNow, let us speak a bit about "Little Gidding" because we're almost out of time and I do want to hear T.S. Eliot read from it. Go ahead, Jewel. Tell us about this poem. BROOKERWell, this is -- in Eliot's view, this was the greatest of the quartets and, you know, the sort of poem that brought all of the things together. He did visit "Little Gidding" which -- in 1936. He was there in May, which is very important, eluded to -- referred to actually in the first part of the poem. Little Gidding is a community north of Cambridge, which in the 17th century was known for its sanctity. A committed group of Christians retreated there. And it was there during the Civil War that Charles II came for -- when he was fleeing from Cromwell. But the context of "Little Gidding" is the Second World War. ELIOT"We shall not cease from expiration and the end of all our exploring will be to arrive where we started and know the place for the first time. Through the unknown remembered gate when the last of earth left to discover is that which was the beginning, that the source of the longest river, the voice of the hidden waterfall and the children in the apple tree not known because not looked for, but heard, half heard in the stillness between two waves of the sea. ELIOTQuick now, here now, always a condition of complete simplicity costing not less than everything and all shall be well and all manner of things shall be well. When the tongues of flame are enfolded into the crowned not of fire and the fire and the rose are one." REHMAnd that as you've reminded me was read at Margaret Thatcher's funeral, Tony. CUDAYeah, it was. And it's a beautiful passage filled with hope and possibility. David talked to us about that at the break. It's a demanding hope, a hope that is going to take a struggle and a search. REHMTony Cuda, Jewel Spears Brooker, David Gewanter, thank you all so much. REHMAnd for our next Readers' Review, "The Art of Fielding" by Chad Harbach, story of a college baseball star. I think you'll enjoy it. Join us Wednesday, May 29. Thanks for listening all. I'm Diane Rehm.